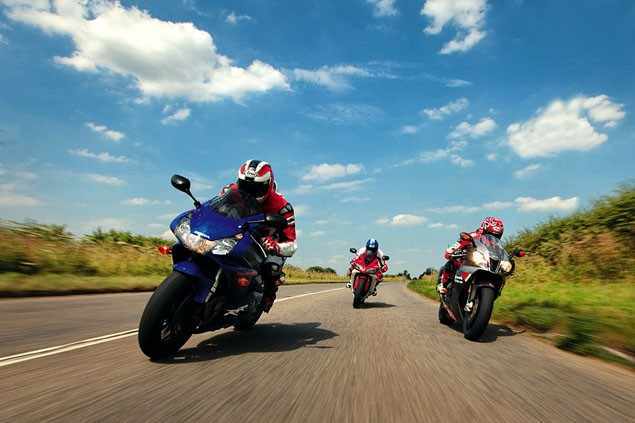 Three of the very finest 1000cc superbikes ever made; the Honda CBR954 Fireblade, Aprilia RSV1000R Factory and the Yamaha R1 are now at bargain prices. There was a time, not so long ago, that sportsbikes looked as good as they went. The original YZF is a prime example. Then mass centralisation, catalytic converters and aerodynamic efficiency got in the way. Suddenly, function overtook form - and they’ve been that way ever since. Ultra-fast, incredibly rapid, but definitely a bit on the Susan Boyle side of things. Meanwhile, used bike prices have been tumbling, making serious performance more affordable than ever before. Having scoured the dealer ads, we got our hands on a fairly high mileage 2003 R1 in decent, almost original condition at the giveaway price of just £3999. Not only that, we got one of its direct rivals of the same vintage lined up – a Honda CBR954RR Fireblade at £4599 and an absolutely mint Aprilia RSV1000R Factory with low mileage and more bling chassis parts than you can shake a worn out kneeslider at for just £4999. So, with our budget set between four and five grand, we headed off to the open spaces and sweeping bends of Buckinghamshire to find out if half the price actually means double the fun.